Transthyretin (TTR) is a protein involved in the transport of thyroid hormones in blood and cerebrospinal fluid (CSF). The only known source of brain-produced TTR is the choroid plexus. In the present investigation, we have identified the subcommissural organ (SCO) as a new source of brain TTR. The SCO is an ependymal gland that secretes glycoproteins into the CSF, where they aggregate to form Reissner’s fibre (RF). Evidence exists that the SCO also secretes proteins that remain soluble in the CSF. To investigate the CSF-soluble compounds secreted by the SCO further, antibodies were raised against polypeptides partially purified from fetal bovine CSF. One of these antibodies (against a 14-kDa compound) reacted with secretory granules in cells of fetal and adult bovine SCO, organ-cultured bovine SCO and the choroid plexus of several mammalian species but not with RF. Western blot analyses with this antibody revealed two polypeptides of 14 kDa and 40 kDa in the bovine SCO, in the conditioned medium of SCO explants, and in fetal and adult bovine CSF. Since the monomeric and tetrameric forms of TTR migrate as bands of 14 kDa and 40 kDa by SDS-polyacrylamide gel electrophoresis, a commercial preparation of human TTR was run, with both bands being reactive with this antibody. Bovine SCO was also shown to synthesise mRNA encoding TTR under in vivo and in vitro conditions. We conclude that the SCO synthesises TTR and secretes it into the CSF. 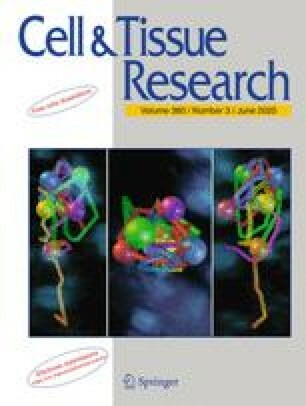 Colocalisation studies demonstrated that the SCO possessed two populations of secretory cells, one secreting both RF glycoproteins and TTR and the other secreting only the former. TTR was also detected in the SCO of bovine embryos suggesting that this ependymal gland is an important source of TTR during brain development. Financial support was provided by grants 1030265 from Fondecyt, Chile, to E.M.R. and 201.035.002-1.0 DIUC to H.M.